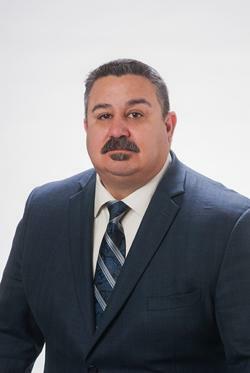 John is a Building Envelope & Indoor Environment Consultant, specializing in indoor environmental assessments, mold & odor investigations, as well as cause & origin forensic water intrusion investigation and building envelope failure for commercial and residential structures. He is a Florida Licensed Mold Assessor, Radon Measurement Technician and Radon Mitigation Specialist, a Council-certified Environmental Thermography Consultant, CETC and a Council-certified Indoor Environmental Consultant CIEC. 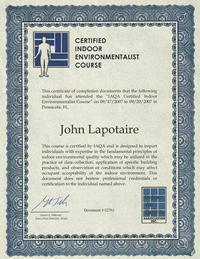 John is an elected member of the Indoor Air Quality Association (IAQA) National Board of Directors. Curently serving as the President of the association. 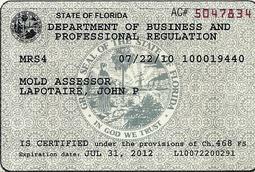 A prior member of the American Council for Accredited Certification the (ACAC) National Certification Board. A prior member of the Institute of Inspection, Cleaning and Restoration Certification (IICRC) Governmental Affairs Committee. An appointed member of the Institute of Inspection, Cleaning and Restoration Certification (IICRC) Environmental Inspection Task Force. A member of the Indoor Environmental Standards Organization (IESO) Committee working on writing a National Standard for Residential Mold Assessment. A member of the Indoor Environmental Standards Organization (IESO) Committee working on writing a Standard Guide for the Inspection of an Educational Facility for Moisture Intrusion and Mold Growth. A voting member of the ASTM International Technical Committee D22 Air Quality. The scope of the committee is the promotion of knowledge, the development of test methods, practices, guides, and terminology pertaining to sampling and analysis of atmospheres, interpretation of data, the standardization of recognized and practiced methods for measurement of atmospheric quality, and sponsoring of discussions among those active in the study of air quality. The work of the Committee will be coordinated with other ASTM Committees and other organizations having mutual interest. A member of the ASTM D729706 committee reviewing the Standard Practice for Evaluating Residential Indoor Air Quality Concerns. This standard practice describes procedures for evaluating indoor air quality (IAQ) concerns in residential buildings. The practice primarily addresses IAQ concerns encountered in single-family detached and attached (for example, townhouse or duplex design) residential buildings. He is a prior member of the Building Enclosure Technology and Environment Council (BETEC) a National Institute of Building Science Council focusing on energy efficient and environmentally responsible homes and buildings. As a CIEC, John has earned the most respected certification in the field of indoor environmental consulting based on his training and field experience in building sciences, industrial hygiene and indoor environmental risk assessment. 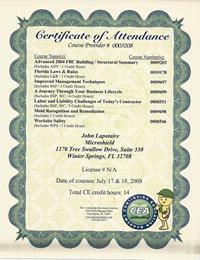 The certification documents his skills and knowledge regarding design, construction and operation of buildings with respect to the quality and efficiency of the indoor environment in a manner that could be relied upon by individuals and organizations seeking his services as a consultant or advisor for the assessment and management of new or established indoor environments. John has proven that he can identify the causes of poor indoor air quality even when problems seem vague or unrelated to visible causes. He has been able to gather and interpret data from various systems operating within homes and offices to help provide solutions to improve the indoor environment. He can Isolate and Identify the source of IAQ Issues in Homes or Offices and provide a solution to IAQ concerns such as, Mold, Bacteria, Infectious Disease, & VOC’s (volatile organic compounds). For the past 10 years, since leaving his position with a corporate builder, John has worked with Individuals, Builders, Contractors, and Building Managers Isolating and identifying the source of building envelope failures and IAQ concerns and providing solutions to improve their indoor environment. John has the knowledge and experience in Building Science allow him to conduct Cause and Origin Building Envelope Analysis, Investigations & Assessments, and Forensic Water Intrusion Investigations that often identify the cause and origin of indoor environmental contaminants. John has performed Indoor Air Quality; mold and bioaerosol investigations, field investigations, and forensic diagnostic inspections throughout Florida for both commercial and residential properties. He has personally prepared hundreds of remediation protocols in accordance with the ANSI approved IICRC S-520 for both commercial and residential projects. John has conducted mold causation, water entry diagnosis, risk evaluation, odor source diagnostic investigations since 2001. His first certifications were with the IICRC in the early 90’s involving water restoration and smoke damage. His training has continued as shown below and includes training in the collection and measurements of specific indoor air contaminants, including respirable particulate matter, volatile organic compounds, mold and bacteria. Cause & Origin Forensic Water Intrusion Investigation and Building Envelope Failure, Building Envelope Analysis, Indoor Environmental Diagnostic Inspections, Investigations & Assessments, Forensic Water Intrusion Investigation, and Indoor Air Quality Assesment, Investigation and Testing. John keeps in touch with the IAQ industry by managing the LinkedIn Groups for the IAQA, Indoor Air Quality Association, Indoor Environmental Standards Organization, and the NAHB National Association of Home Builders. These Groups were established on LinkedIn February of 2008 with the goal of promoting the Indoor Air Quality Association, NAHB National Association of Home Builders, and IESO Indoor Environmental Standards Organization. within the LinkedIn network and encourage discussion regarding the IAQ industry in the Groups Forum. John is often asked to provide Indoor Air Quality, Building Envelope, and Water Restoration presentations to professional organizations across Florida. · Florida Solar Energy Center FSEC. EPA, Environmental Protection Agency, "Introduction to Mold and Mold Remediation for Public Health Professionals"
“"John Lapotaire Lapotaire and Microshield Environmental Services have been a pleasure to work with. John Lapotaire has provided me with expert advice on how to protect my homes and offer my customers an environmentally safe home. From John Lapotaire to the office staff and field personnel, all have been professional and reliable. “I first met John Lapotaire when Buyers of mine wanted their home tested for absolutely everything in the world! I thought their request was frivolous, considering that the home they were buying was just about brand new! John Lapotaire proceeded to maneuver his equipment like a pro! Ultimately, when the time came for the inspections to be completed, John Lapotaire's report was succinct, exact, and presented in a clear, precise and respectful manner. I have just called John Lapotaire to have the drywall tested in our personal home! If i did not think John Lapotaire was THE BEST in Orlando, I would not have called on him the minute I heard about the Chinese Drywall problems! “Thorough understanding of building construction issues and relationships of those looking for solutions to problems. I've known John Lapotaire to be thorough, knowledgeable and dilligent in all facets of work that he performs. “John Lapotaire is a pleasant surprise to his service industry! He is highly educated in his field and has performed above and beyond the scope of what I thought was his "job description". “John Lapotaire is a savvy business person that knows his field well. He understands the details behind mold remediation and water extraction as it relates to both residential and commercial applications. “When working with John Lapotaire, I found him to be an enthusiastic manager, who strived to build a cohesive team. He was always striving for the correct solution in a fast paced, frenetic, environment. He is extremely knowledgeable in all facets of the construction industry. “John Lapotaire is very thorough in writing his protocol for mold remediation. He is very detailed and supplies a report that puts him and his company at the head of class. “I have known John Lapotaire for over six years and have always found him to have a very high standard of work ethic and integrity in everything he does. ““Consistently high customer satisfaction results and a focus on delivering quality built homes are among John Lapotaire's many strengths. “John Lapotaire is organized, efficient, extremely competent, and has an excellent rapport with people. “John Lapotaire was the perfect addition to our team. “John Lapotaire is very experienced in his field and conducts himself in a very professional manner. I would highly recommend using John Lapotaire in your next project. “John Lapotaire is the type of IEQ consultant that is constantly seeking out the most current information on all aspects of IEQ issues. “John Lapotaire, Thank you for the work that you have done for me. “John Lapotaire is a dedicated professional who keeps up on his trade giving back to the community through public talks on IAQ and volunteering as an adult leader and trainer for Central Florida Council Boy Scout program. 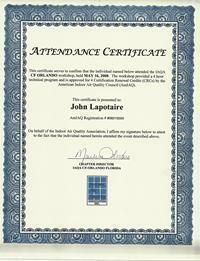 “John Lapotaire has extensive training and experience in the Indoor Air Quality field and is highly qualified. 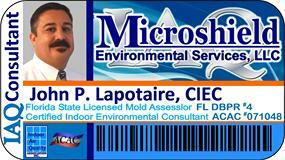 John Lapotaire's company, Microshield Environmental Services is the only IAQ company I recommend to my clients. I recommend him knowing our mutual clients will be completely satisfied with his work and professionalism. “You may find several people to attest that John Lapotaire is an expert in his field. What many may not know is his commitment to community and providing a better environment for which people live and work. John Lapotaire did not hesitate when I presented an opportunity to help out a local historical group with a building that has some challenges. “John Lapotaire is a professional who always delivers quality service on time, in budget and with confidence to exceed expectations. “I have known John Lapotaire for several years and have learned that his combination of professional and personal qualities sets him apart from others. John Lapotaire approaches each individual as his most important client, creates lasting relationships, and always exceeds expectations. His sincere and professional approach, his unmatched ethics and integrity, and amazing passion for serving others are matched only by his outstanding results. “I learned of John Lapotaire's Environmental Microshield Services business about a year ago. I invited him to do a presentation at our USGBC-Brevard Branch meeting. John Lapotaire has a great presentation. He is very knowledgeable and informative. “John Lapotaire is a trustworthy, loyal and dedicated individual. My experience in dealing with him has been very good. I know him in a training and leadership capacity and he has proven to be very capable. He is personable, a good communicator and problem solver. He has dedicated his personal time to community service in development of youth through the Boy Scout movement. “I am pleased to share my professional experience with John Lapotaire. I have known John Lapotaire for a couple of years now. He has functioned as a mold assessor. My company has functioned as a mold remediator. 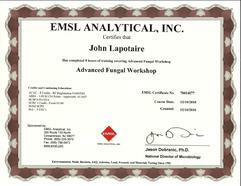 I have repeatedly referred my clients to John Lapotaire for their mold testing needs. “John Lapotaire has been a great blessing for us at H2o911 Restoration in Central Florida. John Lapotaire is highly respected by our employees at H2o911 Restoration for his willingness to help anyone anytime he can. He is very well organized, diligent in his paperwork, easily reachable, and always on time. We will return to John Lapotaire for many years to come. “John Lapotaire's testing of the premises and subsequent recommendations were just what we needed to address an IAQ issue. 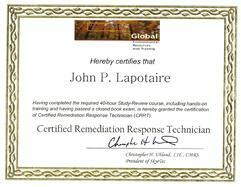 “I have worked very closely with John Lapotaire P. Lapotaire to manage mold remediation services. He has provided professional guidance to determine the most effective means to manage this critical work and be in compliance with the IICR S520 Standard and Reference Guide for Professional Mold Remediation. 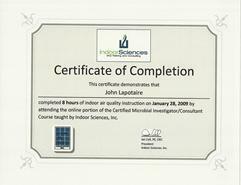 During the time we spent analyzing and implementing the least cost alternatives, I was able not only to gain firsthand knowledge of John Lapotaire P. Lapotaire's abilities as a professional Building Envelope & Indoor Environmental Consultant but also exposed to his work ethic to solving commercial and residential antimicrobial application considerations. John Lapotaire P. Lapotaire's performance in all of these areas is outstanding and I respect his knowledge and his business planning expertise. “I worked with John Lapotaire while he was involved in the construction management field . John Lapotaire's keen attention to detail and drive to find better more efficient processes in the industry pushed John Lapotaire to the top of heap as a true entreprenuer in the construction industry. It was always a pleasure to work with John Lapotaire. “John Lapotaire is an outstanding professional. I have no issues with putting John Lapotaire in front of my customers to help explain the processes involved with our remediation and rebuild projects. “John Lapotaire is a highly competent professional with broad working knowledge in indoor air quality and HVAC systems. His skills with interpersonal relationships set him apart from others in the field. “John Lapotaire is the consummate professional. His dedication to learning and education has enabled him to stay at the top of his game and, in the process; help hundreds of people improve their living conditions indoors. 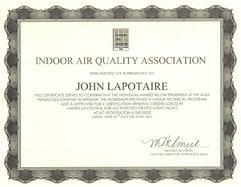 “John Lapotaire's knowledge and expertise in the field of indoor air quality and moisture is outstanding. “John Lapotaire has abundant industry and product knowledge. He is by no means new to this industry. “John Lapotaire is a great guy to work with. We have worked together on several Boy Scout projects. He has always demonstrated hard work, attention to details, great follow up, and a real caring for all the individuals involved. “I have worked with John Lapotaire for many years within the Boys Scouts of America organization. John Lapotaire is one of those people that when he does something whether work related or projects outside of work he does it hundred percent, he is definitely a perfectionist. If we ask John Lapotaire to do something whether big or small he takes it and runs with it. “I have Known John Lapotaire throughout my lifetime. He has been a great help to me a number of times. He is always there when needed and dose an awesome job. “John Lapotaire has a vast amount of experience in Indoor Environmental Issues and has solved many of my customer’s mold and mildew issues. “I work with John Lapotaire as a volunteer in the Boy Scouts of America. I consider John Lapotaire enthusiastic, competent, and caring. He has a solid foundation in leadership as a combat veteran in the US Army that has served him well in his business and with sharing that leadership to the young boys and men within the Scouting program. I would recommend John Lapotaire to any organization, business, or person for his commitment and dedication to any task or purpose. “John Lapotaire is an upstanding guy. If he says he going to do something, he does it and does it well. “John Lapotaire has been a trusted colleague and service provider to me for the last five years. I highly recommend him. John Lapotaire P. also does excellent work. “The building I worked in was known as a "sick" facility. “John Lapotaire has a business acumen most clients look for and appreciate. “John Lapotaire is a dedicated professional that is involved with the upstanding non-profit organization, Indoor Air Quality Association (IAQA). Furthermore, he voluntarily pursues the certification of the AmIAQ Council's, Certified Indoor Environmental Consultant. 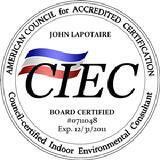 This is the only certification body that offers CESB board certified training for the Indoor Air Quality arena. 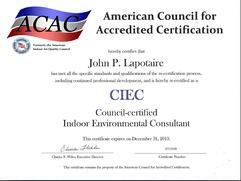 “John P. Lapotaire, CIEC is one of Florida’s Leading Indoor Environmental Consultants and is currently on the American Indoor Air Quality Council (AmIAQC) National Certification Board. John Lapotaire is an honest Indoor Air Quality (IAQ) Consultant that you can count on. “I have engaged John Lapotaire's firm on several occasions we have always found his firm to be professional, knowledgeable and a team player. John Lapotaire reflects a lot of diligence to be a top source of information in his field. “After bad experiences with other companies in this field and receiving conflicting advice with poor results and delayed answers etc. John Lapotaire was a breath of fresh air. His knowledge, professionalism, desire and willingness to work with and advise me to ensure that I performed the best work possible to give my clients the best results possible vs just being a testing company who only cared about getting paid to perform tests regardless of the outcome was outstanding. “John Lapotaire is straightforward, reasonable and intelligent, making him the ideal client to work with. His extensive knowledge of his product inspired me to learn a great deal about it...and to resolve to hire him to treat any new house I build in the future. “John Lapotaire did a great job for us. “I recently worked with John Lapotaire when he referred me as a local Industrial Hygiene Consultant to do testing on a difficult project he was dealing with. John Lapotaire's Professional Ethic's, Industry Knowledge, Approach, and Attention to Detail matched our Companies Ethical and Professional Standards allowing us to work easily with one another. 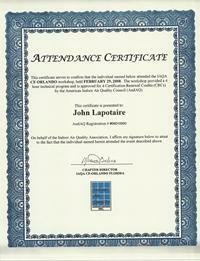 John Lapotaire is a dedicated, driven professional in the IAQ arena with substantial knowledge in building diagnostics. “John Lapotaire was very helpful in an asbestos abatement case where the homeowners were looking to renovate their existing kitchen but had flooring that contained asbestos under their kitchen tile. John Lapotaire helped me with walking the homeowner through what we needed to do to get the job done. John Lapotaire always returned my calls and was very helpful in helping me understand what needed to be done. “I have relied on John Lapotaire over the past few years for his expertise in regards to indoor air quality. I am involved with the spray foam industry which places a high importance on healthy buildings. 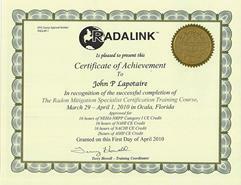 John Lapotaire's expertise in this field has proved valuable to me on numerous projects. “John Lapotaire always provides professional, experienced service for us and our clients whenever we have a mold mitigation challenge. During several of our renovation projects, John Lapotaire has worked both as a subcontractor and as a consultant for us and we rely on his expertise whenever we are confronted with these issues. I would be glad to recommend John Lapotaire and his company for your needs. 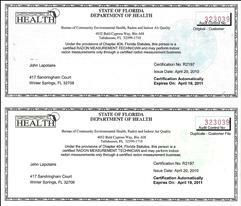 “John Lapotaire is an experienced indoor environmental consultant that has helped many of the Florida consumers we have referred to him in Central Florida. 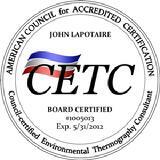 Commercial or residential consumers should consider John Lapotaire for their indoor environmental concerns. “John Lapotaire is a very genuine professional who takes each and every endeavor very seriously from working with Boy Scouts of America to helping solve indoor air quality issues. He takes pride in what he does and makes sure no stone is unturned when completing a task. “John P. Lapotaire has many good attributes. It's not fair that we only have to choose only three because he does his job very well. John Lapotaire is personable; works well will colleagues, and clients. Anyone who comes in contact with John Lapotaire can feel comfortable with him. John uses the knowledge of a builder and the building industry, he knows the drill. He pays attention to all details and believes in his work to help protect both the home and business owner. “John Lapotaire is very dedicated and always there to lend the helping hand. He listens to your needs and delivers with no delays or problems. “John Lapotaire is a great guy. I've worked with him on a social basis in Scouts for a number of years. He is well organized, straightforward and very personable. “It is my pleasure to endorse and recommend John Lapotaire. John Lapotaire is fair and acts in a very professional manner in his work. I look forward to working with him in the future as our friendship continues. “I had the pleasure of working with John Lapotaire when he was hired to run construction for one of our divisions. I was running another division at the time but worked with him every day. “I have had the opportunity to work on several projects with John Lapotaire and found his analysis and recommendations to be thorough and well thought out. His concern for his client’s well-being is second to none. “I have known John Lapotaire for quite a few years. I highly recommend John Lapotaire due to his knowledge, professionalism, and being an up standing person. 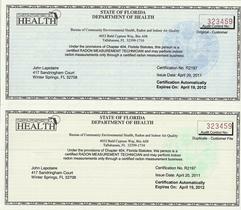 “I know John Lapotaire as a member of the Metro Orlando Home Builder Association. I know him to be a hardworking, conscientious, and honorable person that one can trust to provide the facts of an issue. “I would highly recommend John Lapotaire for any of your Environmental issues pertaining to real estate. Before you build or remodel, give John Lapotaire a call. “John Lapotaire pays attention to what the customer wants, and gets it done. He is cheerful, customer focused and mindful of details. “I am writing this recommendation for John Lapotaire because I find his work ethic, his desire to deliver high quality standards of excellence to his peers and clients as absolutely outstanding. John Lapotaire please use my name and refer me anyone that you desire to have talk to me about yourself and the quality of workmanship that you give freely and openly. 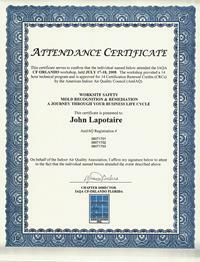 “John Lapotaire has become a knowledge source for the indoor air quality industry. “I attended the C.I.E. prep course facilitated by the IAQA with John Lapotaire. He was very knowledgeable in this area and provided excellent feedback for those in attendance that had little or no experience in the field. 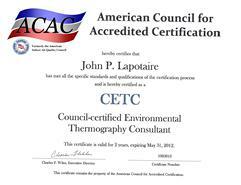 “John Lapotaire is a consummate environmental professional with great attention to detail. “I have worked with John Lapotaire through our common interest which is Boy Scouts of America. John Lapotaire shows a true passion to his position in scouts as a leader and seems to have dedicated his heart to a job that is a volunteer position. We both have busy schedules but find the time to help not just our own sons in this program but many other parent’s sons as well. THE BSA is a organization is one that teaches young boys the true path to becoming a trustworthy and loyal person, this portion of John Lapotaire’s life shows that he has these ethics and that John Lapotaire shows them both in his personal life as well as I would say his professional life. “John Lapotaire is an outstanding professional who exercises integrity, honesty and understands the true meaning of customer service. “John Lapotaire provided information for a project. “Jon is a detail and focused professional. He takes pride in providing excellent service and is passionate about what he does. I highly endorse John Lapotaire. “As a real estate professional, I have been in a position to refer builders and property managers to John Lapotaire to handle environmental issues that could potentially arise in homes. John Lapotaire is a true professional and I would highly recommend him and his company. “John Lapotaire conducts his work with a very high degree of integrity. “John Lapotaire is extremely knowledgeable in the area of mold contamination and what causes the situation to happen in the first place. “John Lapotaire is first class, provides excellent service and detailed reports. “John Lapotaire is a man of his word and a true expert in air quality. I have known John Lapotaire for several years and trust his opinions and know that I am getting the best quality service available. “John Lapotaire is extremely professional in all aspects of his field, provides a great service for the price quoted and shows up on time. You can't go wrong with John Lapotaire as he will always guide you in the right direction. 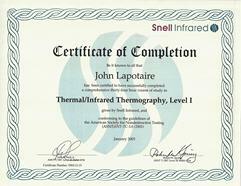 “John Lapotaire completed air quality testing for us following an extensive mold remediation. “John Lapotaire impressed me with his knowledgeable and detailed handling of a difficult remediation situation involving a failed spray foam installation. “I have worked with John Lapotaire recently for clearance testing at a residential property where he was to access the work we have completed followed by air quality testing. “I have worked with John Lapotaire on numerous occasions in the past 3 years. His level of integrity, professionalism and dedication to his customers surpass by far any air quality company I have ever worked with by far. Every customer I come across that needs this type of service, I highly recommend. Have yet to have one of my customers be more than satisfied to say the least. “John Lapotaire was very detailed, personable and easy to work with. He provided thorough services and was timely with determining our indoor air quality and remediation assessments for our home. “We hired John Lapotaire to take the lead in developing and implementing a high quality air system in our home since asthma runs in our family. He did an outstanding job managing the project and we're very happy with the results. 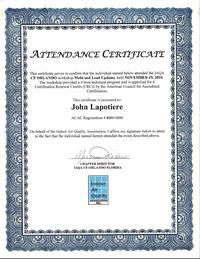 “We at H2o911 have used John Lapotaire services over 30 times. Always on time. Reports are very easy to understand. Documentation has been perfect. We would be at a severe dis advantage if the report wasn't by John Lapotaire on any mold remediation. “John Lapotaire and I have worked together on several Boy Scout Leader Committees. John Lapotaire is a true professional. John chooses to lead by example, setting the bar high for others to follow. He's kind, fair, considerate, motiving and organized. “John Lapotaire has always been a true professional. He is absolutely one of the "good guys" in our industry, wish there were more assessors out there like him.